“A good teacher can inspire hope, ignite the imagination and instill a love of learning”. My love for the English language, Geography and Biology is all because of the wonderful, encouraging and inspiring teachers I have had during my school days. Teachers can either make a child hate or love a subject according to how they treat their pupils. My fear for numbers probably started when I was in the 7th standard and we had a horrible teacher. If you did not understand how to tackle a formula or understand any of the geometry or algebra, she would just shout out stating that she is just wasting her time with brainless kids. Yes she was like a witch for all who hated maths and was a fairy to all who were her pets. Till today, I try and stay away from numbers and physics. There are some teachers, students remember all their lives either for the good things or bad things. Overall I have been lucky to get wonderful teachers throughout my academic life. Later on, I started a career in teaching and tried to be more of a friend than just a teacher to the students. I remember I had a student who spent a whole term on my lap learning how to write, colour, paint etc etc. Some have made me run around a lot, disappearing to the playground, spending endless minutes in the toilet, hiding behind the bookshelf etc. But the most satisfying moments were when all the students left my classroom at the end of the academic year knowing how to read and write.Their love, interesting stories, caring nature and innocence made each day an adventure in my life. It is most befitting to take the opportunity to thank one person who made learning very interesting for me and that is none other than my kaka(uncle). I remember he would encourage me to read Readers Digest and small articles in the newspaper. This truly helped me to improve my English, develop a love for reading and write interesting essays. My kaka had a huge world map on the wall in his room and in the evenings he would play a guessing game with us. He would call out the name of a country or a city and we had to find it on the map. Playing scrabble and making huge jigsaws with him and my cousins was our favourite pastime on Sundays. So basically, what I am trying to say is that teachers are not only found in schools but in our daily lives too at home or in our neighbourhood. I would not have learnt cooking if it were not for my mum,Nunu (mother in law) and my kaki. A big big thank you to all the teachers in my life. Life itself is a big lesson which never ends as we learn something from every person that touches our lives. When I was teaching, most students would gift a flower, a card or a cake. I want to share a recipe for muffins on this special occasion. I wanted to update the photos. 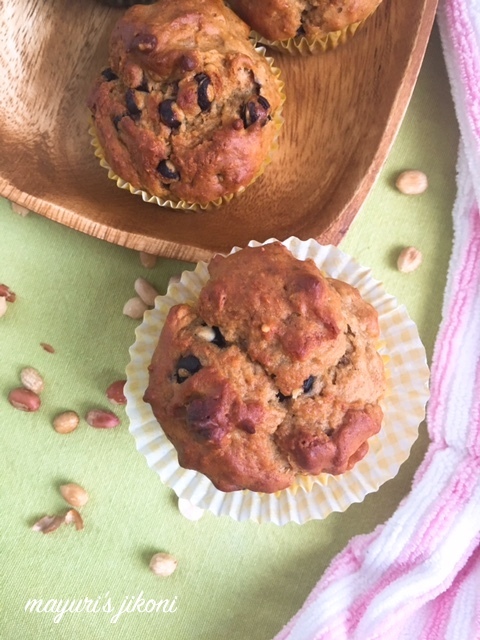 However, in my enthusiasm to bake these flavorful muffins, I forgot one rule of baking muffins…. do not add additional blobs of batter. The muffins will be shapeless like mine. However, the below clicks will have to do till I bake them again and take better photos. I made small changes like I used half quantity plain flour and half quantity wheat flour. I replaced the sugar with brown sugar. I added more chopped peanuts to get that extra crunch. Peel and mash the bananas. You should get about 1 cup. Line the muffin tray or cups with paper cups. Sieve the flour along with the soda bicarbonate, baking powder and salt. Add the chopped peanuts and chocolate chips to it and mix well. In another bowl add peanut butter and both the sugars. Beat it till it is mixed. Add milk, yogurt and mashed banana and beat well. Add the flour mixture and mix just enough so that the flour has become wet. Do not over mix. Spoon the batter into the prepared cups or tray. Fill ¾ of the cup. Place the tray or cups in the oven and bake for 20 minutes or until the muffins are golden brown. Insert a toothpick or a fork into a muffin. If it comes out clean then the muffins are done. Remove the muffins from the oven. Place the muffins on a wire rack to cool. Don’t add the peanuts if you do not like them. Roast the peanuts in an oven for 20 to 30 minutes at 100°C. Rub them between a kitchen cloth to remove the skin. Using over ripe bananas for cakes and muffins is good. Use dark or milk chocolate chips. If chocolate chips are not available in your area, just take a bar of chocolate and chop it up. An ideal treat for kids and adults as something special for lunch. Use half quantity plain flour and half quantity wheat flour. Replace the white sugar with brown sugar. My daughter is a huge fan of muffins. She would love to take this in her lunch box. thanks for sharing the recipe and sending in your recipes to our event. What lovely muffins, thanks for sending them to Flavours of USA and Canada event.